Indicate major problems in the safety and credibility of a health care center. They include things likes mismatched blood transfusions, major medication errors, surgery on the wrong body part and pressure ulcers/ bedsores. They also include items, like surgical sponges, left inside a patient after surgery. Yet the Institute of Medicine estimates more than 100,000 such incidents occur annually, resulting in more deaths than car accidents and more than $9 billion in excess charges. A recent analysis published in the New England Journal of Medicine details a case wherein a 42-year-old woman reported to a primary care center with bloating – only to discover in a CT scan that two gauze sponges had been left inside her abdomen from one of two (or both) prior C-section surgeries – one six years earlier and one nine years earlier. CNN reports she’d had no prior abdominal or pelvic surgeries. The sponges had become attached to her stomach and colon tissue, posing a serious health risk, though she ultimately did survive following another surgery. While that particular case occurred in Japan, the American Society of Anesthesiologists notes there are approximately 4,500 to 6,000 cases of surgical items left inside patients in the U.S. every single year. That’s a low-ball estimate because surprisingly, there is no federal mandate requiring these incidents be reported to government health officials. The New England Journal of Medicine conducted another analysis about 15 years ago concluding about 7 in 10 cases of items left inside a patient following surgery are sponges, while the remaining number are typically instruments, such as retractors and clamps. Beyond pain and discomfort, the presence of these items can spark infection, resulting in sepsis, sepsis shock or death. Our South Florida medical malpractice attorneys in West Palm Beach know the applicable standard of care for most hospitals and surgical centers (as set by the U.S. Joint Commission’s Universal Protocol) calls for specific development and enforcement of procedures that medical professionals should follow to reduce the chances of this kind of incident. If there is evidence these steps weren’t followed (or a lack of evidence that they were), that could be grounds for pursuing a medical negligence claim. In many cases, the mere presence of surgical items left inside a patient is strong evidence that protocol wasn’t followed. These surgical mistakes occur more frequently in high-stress surgeries (including emergency surgeries) and those wherein plans are unexpectedly changed. Some researchers have concluded there is a 90 percent increase in “never-events” during emergency surgeries. 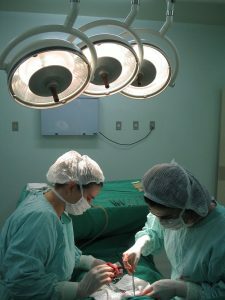 The Association of Operating Room Nurses developed protocol wherein count of sponges and instruments must take place at least five times – prior to the start of the procedure, anytime an item or instrument is used and then three more times when the surgeon is closing the bodily cavity, the wound and the skin. It’s worth noting, though, that in some surgeries, there could be up to 100 sponges in use. Any surgical procedure has the potential for complications, but to prove medical negligence, one must show the incident was not within the necessary or reasonably foreseeable results of the procedure and that the prevailing standard of care was breached. However, F.S. 766.102(3)(b) holds that discovery of a foreign body (such as a surgical sponge) inside a patient is prima facie evidence of negligence on the part of the health care provider, meaning the burden of proof shifts from the plaintiff (to prove that it was negligence) to the health care provider (to prove that it wasn’t). If you or someone you care about has suffered from one of these so-called “never events” during a surgery, it’s important to contact an experienced medical malpractice lawyer as soon as possible. Although the statute of limitations for medical malpractice cases in Florida is typically two years, this can be extended in these cases to the time at which the error was discovered or reasonably could have been discovered. In these cases, that is often several years post-surgery.